Thoughts from the Well: They're RUBBER BANDS. 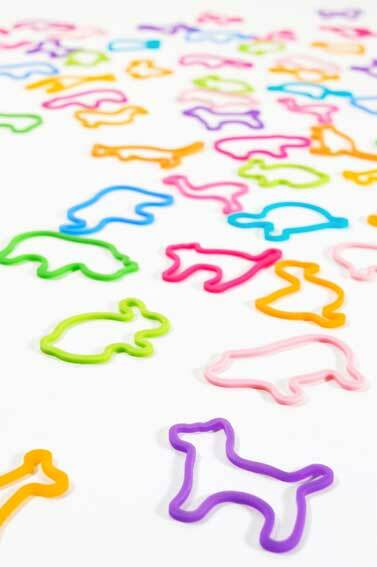 When we traveled up North earlier this summer, I learned about a new trend sweeping in from the East: Silly Bandz. These are thin rubber bracelets in shapes like animals, musical instruments, anything you can think of. I got mine in packs of 12 for $3. Someone is getting rich off these, because even the knockoffs are 24 for $4.99. And apparently kids are wearing them all up their arms and they trade them with each other for more variety. I had never heard of them, but purchased a couple sets for the kids for "sometime." I was thinking Christmas stockings. "Sometime" finally arrived this week, as the crazy trend made it here in time for the start of school. On Friday, three days before school started, Boo found a package in the store and swooned over them. After never having mentioned them before, she suddenly developed an overwhelming need for these (that she has always wanted). 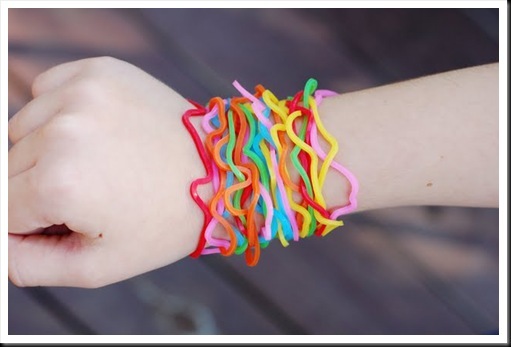 All I heard about all weekend was "can I get some Silly Bandz?" Saturday morning she realized we were out of eggs, and she immediately assessed that we needed to go to Kroger stat to get more. I agreed. Next thing I knew she was at the front door with her purse in hand, ready to accompany me. This is highly unusual behavior, as she not only avoids errands as much as possible, but doesn't carry a purse. Halfway to the store, I realized she had brought her coin collection with the intention of buying two sets of Silly Bandz: one for her and one for her brother. Which was supposed to make me more willing to let her spend the money. Boy, was she disappointed when I didn't let her spend her money. I had decided to gift the packs of bands I had, to the kids on their first day of school, Monday morning. Unfortunately, I forgot. And sure enough, they came home talking about Silly Bandz. I resolved to give them the second morning. Unfortunately, I forgot again. On Tuesday, Boo came home with one she had gotten from someone at school. Knowing the kids are trading them with each other, I asked her if it had been given or traded for. She revealed that she had traded for it. What had she traded for it? I wondered. She had traded one of her (seven, precious) tooth fairy coins. A gold presidential dollar, thankyouverymuch. Believe me, I remembered to give the bags of Silly Bandz on the third day. The kids were in heaven. They wore those bands to school with pride. But then something odd happened. Yesterday, the fourth day, Boo suddenly didn't want to wear them to school. This morning I asked if she would wear them today, and she said no, they're starting to say people can't wear them to school. All this fuss for a bunch of overpriced cheap crap from China that I could have invented myself and made enough money to hire a housekeeper, a personal chef, a laundromat, a nanny and a live-in masseuse. That's so funny...we traveled to MA this summer where the sillybandz craze was in full swing. My kids didn't seem to get it. And I don't think it's really hit NE yet. I have seen a few here and there...but not the insanity that we witnessed in the northeast. Ohhh...the ending of this story makes me so sad! All that anticipation! At least they got one good day in before the school enacted the ban! So glad that, when my kid asked, I said, "wait and see if the other boys your age are wearing them." They haven't been mentioned again!